We’ve been interested in autonomous cars for years and wanted to update you with a couple of advances in the acceptance of the car of the future. In the face of increasing competition for the consumer’s grocery dollars, Kroger is testing the use of driverless cars to deliver groceries in a Phoenix suburb. Kroger's pilot program launched in August 2018, with a robotic Toyota Prius vehicle parked outside one of its own Fry's supermarkets in Scottsdale. A store clerk loaded the back seat with full grocery bags. A man was in the driver's seat and another was in the front passenger seat with a laptop. Both were there to monitor the car's performance. Cincinnati-based Kroger Co. is partnering with Nuro, a Silicon Valley startup founded by two engineers who worked on autonomous vehicles at Google. "Our goal is to save people time, while operating safely and learning how we can further improve the experience," Nuro co-founder Dave Ferguson said in a statement. 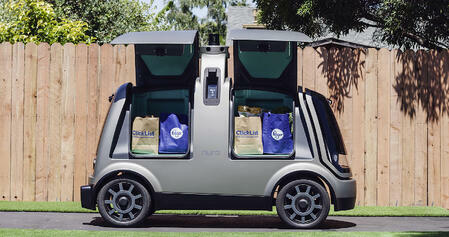 Now Kroger is adding Nuro’s R1 vehicle to the fleet introducing the fully driverless component to the delivery service. The R1 can drive on public roads and operates without a driver or passengers. The R1 delivers goods – in this case groceries. Under the self-driving service, shoppers can order same-day or next-day delivery online or on a mobile app for a flat rate of about $6. After the order is placed, a driverless vehicle will deliver the groceries curbside, requiring customers to be present to fetch them. Funded by the National Science Foundation’s Cyber-Physical Systems program, the research was led by a multi-disciplinary team of researchers with expertise in traffic flow theory, control theory, robotics, cyber-physical systems, and transportation engineering. Human drivers naturally create stop-and-go traffic, such as when someone makes a lane change or merges, or because of natural oscillations in human driving. The researchers found that by controlling the pace of the autonomous car in their field experiments, the autonomous car controlled the traffic flow by dissipating the stop-and-go waves so that traffic wasn't oscillating as it does when all of the cars are driven by humans. The researchers determined that even a small percentage of autonomous vehicles (5 percent) could have a significant impact in eliminating waves and reducing the total fuel consumption by up to 40 percent and the braking events by up to 99 percent. We hope you found our update on one of our favorite topics interesting. When you have questions about your insurance, we invite you to call us for good information and straight answers. Contact us.